Our new spikey scale babies Cleo & Caesar • Bearded Dragon . org . 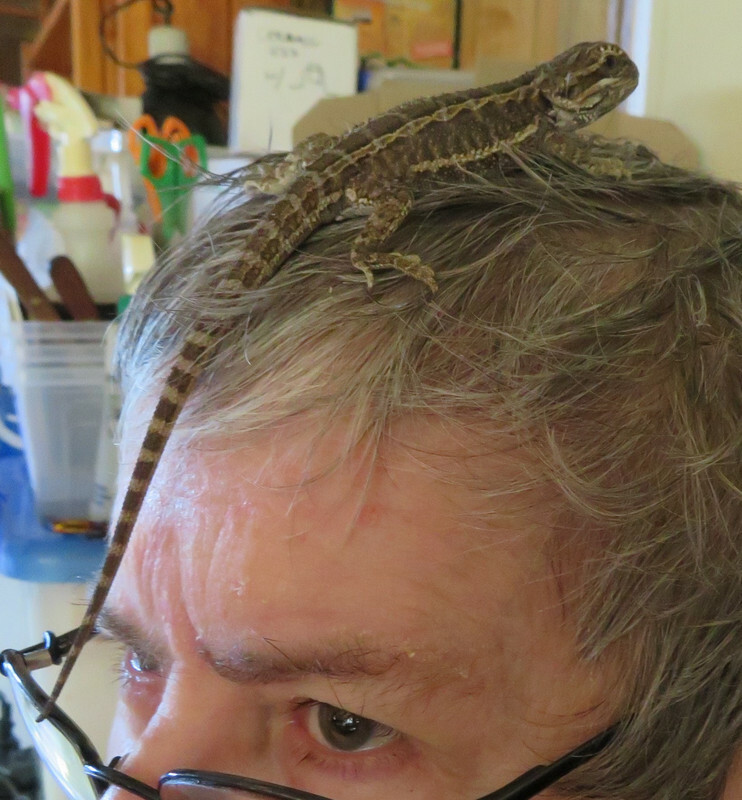 Caesar was not impressed with me today , I had no crickets to give to him …. offered him a few BSFL lavae and the look of disgust he gave me was …. comical. Being a softy I gave in and fished out some newly formed mealworm pupae and newly hatched mealworm beetles who were still soft and light coloured …. he loved them !!! (So did Cleo who climbed off her high basking spot and muscled in Caesar's buggy banquet). She still had room for 8 big BSFL afterwards and made fast work of them. Cleo is smaller than Caesar but seems to have his measure. Caesar shed today ( was dull looking at 3pm when I went off my afternoon siesta , and I found shed skin all over the place when I returned to give the kiddies their afternoon meal at 5pm). Actually saw Caesar nibbling on some salad this afternoon (he's a sly/shy salad eater, wont eat it if he thinks he's being watched). Caesar is definitely armwaving at Cleo. Been trying to get a video of this but every time I turn on the old point n shoot camera and select movie , he stops and stares at the camera - I think he can hear it. Caesar definitely has a taste for the greens - watched him raid the salad / BSFL dish twice today , both times he picked out the strips of buk choi and left the grated carrot and finely diced buk choi whites (stems) and ignored the BSFL. Raided the salad as soon as I deposited it in the dish , and I had top it up again , and be was back into it after his second meal of crickets. He really enjoyed his 25 d/old (1/4 size) crickets (arrived yesterday). He has been eating a few BSFL when I deposit them infront of him. Cleo is the worm junkie - loves her BSFL , takes them whole and live from the top of the fake hollow log , and from my fingers , LOVES getting their meat squeezed out and deposited on her lips too. She's not overly keen on crickets but readily takes them whole and alive from my fingers. I'm giving Cleo an extra meal of insects each day , hoping I can increase the slope of her growth trajectory cf Caesar's (who is a great eater and I have zero worries about wrt his growth and diet and development. Cleo and I are spending a lot of time each day having quality daddy time - she loves being handled and petted and having snuggles , and I think she likes my feeding her separately from Caesar ( on my chest and by hand ). Been getting those little endearing beardie glances from her and she's been wanting to snuggle in my armpit or the crook of my elbow. I think she likes me. A new 26W UVB200 globe and an extra ceramic e27 fitting arrived today and I think I have spare NanoHood set aside , so I'll be setting up another 120L AllSet tub over the weekend so I'll have a 3rd rearing tub ready to go. , I have more . 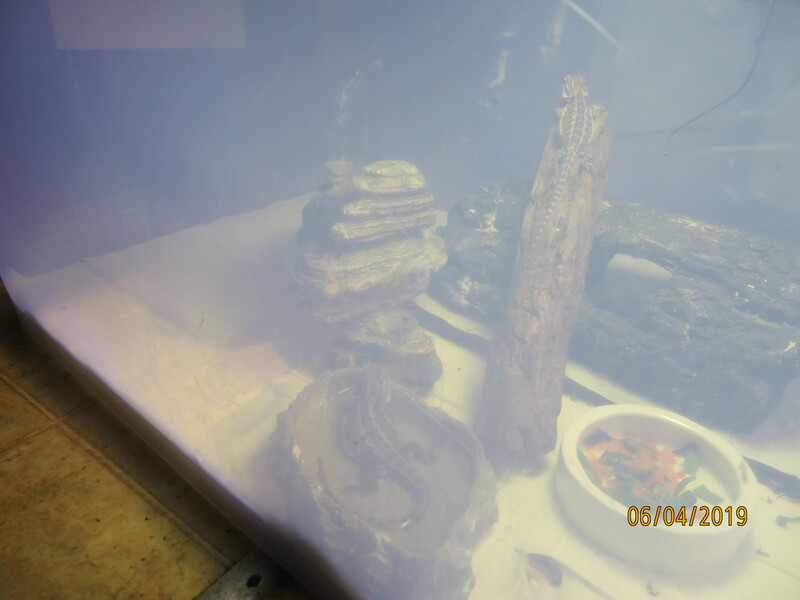 but mostly that are half that size but this one will be too big for the little bearded dragons in few days so I offered it first to Caesar who gave it thorough once over before disappearing back under the 1/2 log, he wanted his crickets. Cleo studied it for a while and stalked it like a cat before deciding to eat it , she disappeared it pretty quick and so I offered another smaller silkworm (she looked at it decided she was too full, she also ignored some BSFL too. A very good size meal for her so I'm pleased she tried it and ate it. Caesar has gained 7.3g this week , now 27.6g. He has grown by 1.8x his original weight in 2 weeks. Cleo has gained 3.7g this week , now 15.6g She has grown by 1.6x her original weight in 2 weeks. Wife reported she saw the pair at the food dish at brekky , and they left only a few little bits of grated carrot and disappeared 6 BSFL between them. Update : Caesar breakthrough << I waited until he was very tired and relaxed and ready to nod off tonight (about 11pm , about 2 hrs after the lights were turned off) and got him out placed him on my chest with my cupped hand over him (just his nose and tail not covered) and he was very good and never struggled and let me stroke him on the head and nodded off on me. Think he's starting to trust me now. Cleo was headnodding at Caesar this evening after their diner, Caesar responded by armwaving back at her. Caesar has now discovered silkworms too. Hoovered down a silkworm I meant for Cleo. 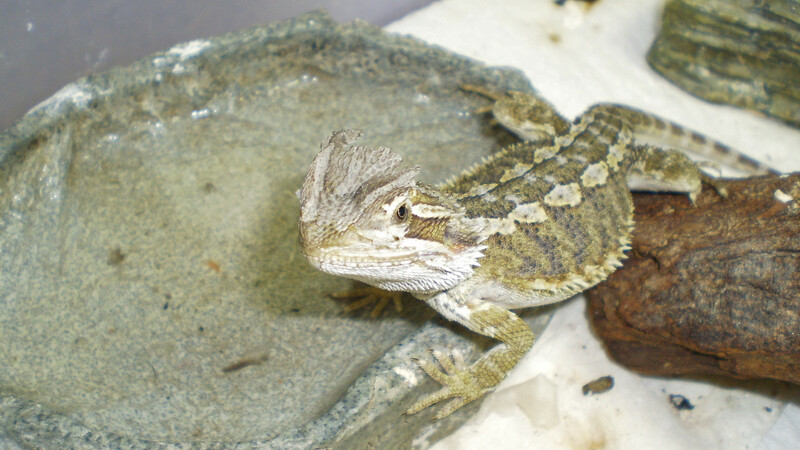 Caesar enjoying a splash in the water dish , Cleo doing usual thing (soaking up maximum UVA & UVB). Cleo likes my shoulder , and this afternoon climbed up top , just to show me who "the boss is". They definitely seem to be warmed up to you. Tombo still would rather run from me than be held. Moro could give a crap less about me, she just wants to explore. But she will at least not freak out at me coming to get her, since she knows shes going to get to explore. Tombo... he will open up his mouth or run. He's a big baby. Caesar had his body skin explosion overnight , and he's a bit unsettled and itchy and unconfortable today , shedding on the eyelids and face and it's REALLY bugging him. Cleo is a sweetheart. Couldn't ask for a more smoogy people friendly hatchling. She thinks she's the ants pants when she's being nursed in my upturned cupped hand and being petted and loves being handfed her crickets , bsfl and silkworms (this way I know for sure she is getting her fair share, else Caesar would just eat most everything (he's a bottomless pit when it comes to crickets & silkworms ( have to restrict him else) and his greens). Caesar settled enough this afternoon to take his silkworm while sitting on my chest , then wanted off immediately . Cleo is now 19.3g ( + 3.7g this week ) ==> normalized growth = 1.93 x her original body weigh (in her first 3 weeks with us). Caesar is now 32.4g ( + 4.8g this week , been in shed ) ==> normalized growth = 2.16 x his original body weight (in his first 3 weeks with us). Now giving Caesar a nightly snuggle on my chest ( tucked in under the front of my t-shirt so he's completely covered and cozy and warm , he seems to like this and settles right away ). I wait for a couple of hours after their lights go out to do the Caesar bonding snuggle.